Santa Barbara Wine Tasting is a one-of-a-kind experience when you join Cloud Climbers Jeep & Wine Tours. The Hotels below are wonderful options of places to stay. 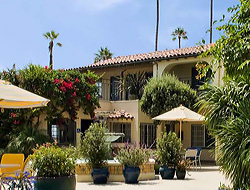 Savor Santa Barbara and its famed vineyards during a two night stay at the newest beachfront boutique hotel located between Stearns Wharf and Santa Barbara Harbor. Experience Santa Barbara’s Wine Country with a professional, local driver from Cloud Climbers Jeep & Wine Tours who will guide you on this delicious journey. Travel in a custom Jeep, allowing wide-open, mountain and ocean views along back-country roads and oak-shaded canyons. Discover insights about area history, wildlife and Santa Barbara County’s wine industry as you venture through the Santa Ynez Mountains, past Lake Cachuma and into Santa Ynez Valley. Your guide will inquire about your favorite wines and select the wineries according to your personal tastes. Enjoy stops at four of the area’s finest wineries to sample a variety of award-winning wines and a gourmet picnic lunch among the vineyards. After a leisurely afternoon of wine sampling, head back to the beach via mountain passes near Reagan Ranch and along the Pacific Ocean. Upon returning to Hotel Milo you’ll have time to enjoy the warm sand, a beautiful California sunset, two pools, Jacuzzi, spa, fitness center, outdoor living room. Later, stroll over one block to State Street to dine at one of Santa Barbara’s many unique restaurants and night spots. Comfortably elegant accommodations, attentive staff, and award winning cuisine make The Ballard Inn & Restaurant one of the most sought after small luxury inns in the Santa Barbara Wine Country. 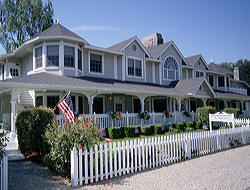 Voted one of America’s Top Ten Most Romantic Inns, it is located in the charming township of Ballard surrounded by the picturesque vineyards and orchards of the Santa Ynez Valley.